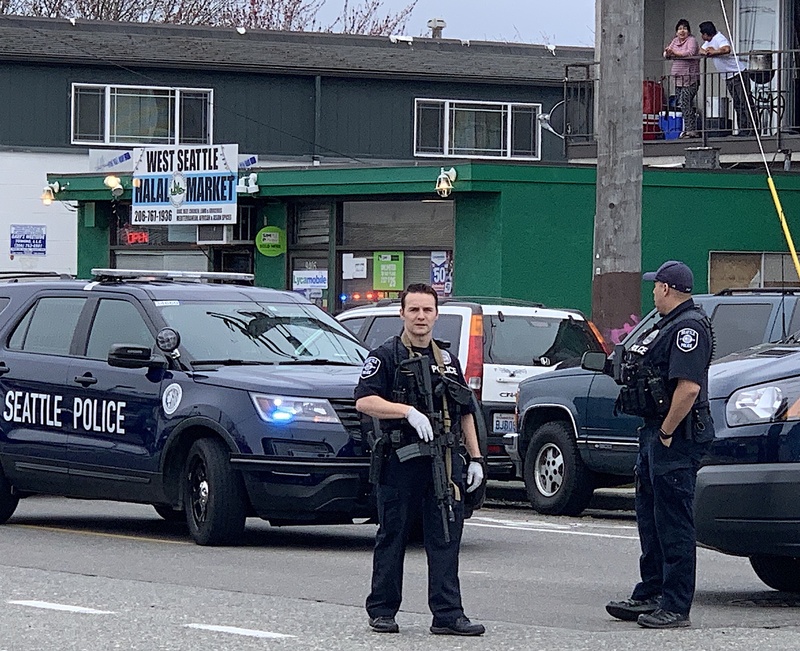 Seattle Police officers with weapons ready were on the scene of a shooting in the 9400 block of 16th SW near White Center on Monday March 25. Seattle Police and Fire Emergency crews were called to a scene in the 9400 block of 16th SW near White Center on Monday following a shooting that sent one man to the hospital with serious gunshot wounds to his back. Capt. Pierre Davis said, "It appears this was a situation where the shooter and victim knew each other but we don't have many other details yet." The White Center area has seen a marked uptick in violence in the last ten days and Capt. Davis said, "The problem is that the criminals come into Seattle and then head back across the County/City line." When asked if a task force might be called to address the problem he acknowledged that it's possible. "We've done them in the past and they were very successful, getting weapons off the street and apprehending bad guys, but it's all a matter of budget of course and scheduling."